Ownership / Access: Museum. Local authority. 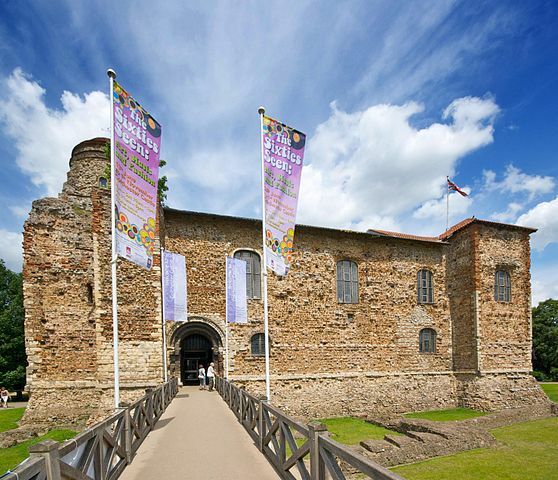 Notes: Colchester Castle in Colchester, Essex, England, is an example of a largely complete Norman castle. It is a Grade I listed building. In 1215, the castle was besieged and eventually captured by King John, during the First Barons' War that led to the Magna Carta. The castle has had various uses since it ceased to be a royal castle. It has been a county prison, where in 1645 the self-styled Witchfinder General, Matthew Hopkins interrogated and imprisoned suspected witches. In 1648, during the Second English Civil War, the Royalist leaders Sir Charles Lucas and Sir George Lisle were executed just to the rear of the castle. Local legend has it that grass will not grow on the spot on which they fell. A small obelisk now marks the point. In 1656 the Quaker James Parnell was martyred there. In 1650 a Parliament Survey condemned the building and valued the stone at five pounds. In 1683 an ironmonger, John Wheely, was licensed to pull it all down - presumably to use as building material in the town. After "great devastations" in which much of the upper structure was demolished using screws and gunpowder, he gave up when the operation became unprofitable. In 1727 the castle was bought by Mary Webster for her daughter Sarah, who was married to Charles Gray, the Member of Parliament for Colchester. To begin with, Gray leased out the keep to a local grain merchant and the east side was leased out to the county as a gaol. In the late 1740s Gray restored parts of the building, in particular the south font. He created a private park around the ruin and his summer house (perched on the old Norman castle earthworks, in the shape of a Roman temple) can still be seen. Charles Gray also added a library and a study. In 1922, the Castle and the associated parkland were given to the Town. The Park is split into the Upper and Lower Castle Parks. The Castle is now a public museum. Between January 2013 and May 2014 the castle museum underwent extensive refurbishment costing 4.2 million. The programme of work improved and updated the displays with the latest research into the castle's history, and supported the repair of the roof.